Absolutely wonderful stay. Too short! The hostel is in a super location and gets you out of the main tourist section. The building is absolutely dear, the courtyard magical, and the breakfast delicious. I have never been that well fed in a hostel before. The only surprise was the fact that I had a cot in the middle of the room. It felt like they might have overbooked and I had the misfortune to end up on a cot. But it was for one night and honestly, more than fine. Thanks for the welcome! Staff and hostel were both amazing! Highly recommend! My stay at Quinta was an absolute delight. The staff were exceptionally helpful and friendly and went out of their way to ensure I had a good stay. 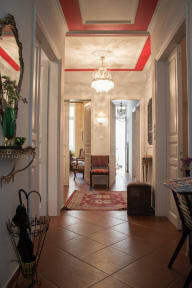 The hostel has a great atmosphere set in a beautifully decorated building. The helpful emails sent providing directions were great and helped to make the trip hassle free and enjoyable. Awesome hostel! I found the location to be perfect for someone looking to be in a fun area that is out of the way of the tourist crowds. It is not close to a metro stop, but that is the only downside. There is a beautiful backyard and was one of the cleanest hostels I have ever stayed in and had really helpful and friendly staff. The rooms were also great. Everything was very accessible and easy to get used to, the only downfall was night time is a little big sketchy in the neighborhood but not threatening from my experience. Beds and rooms were clean and comfy, bathrooms all over the hostel and a lovely outdoor patio and common area. There was tons of helpful hints all over th hostel as well. Very close to loys of food, bars, and parks as well as the metro and city of athens. Highly recommended! Very nice and clean place but sleeping there was terrible. Was given a room next to the front door and it was extremely loud. The buzzer kept ringing until 2am for people to enter. If anyone spoke in the front lobby it would echo into the room. Also there was a very busy street that you could hear traffic and people yelling even though the windows were closed. It got very hot in the room because we could not open the windows and the bed was extremely uncomfortable. Barely slept all night.